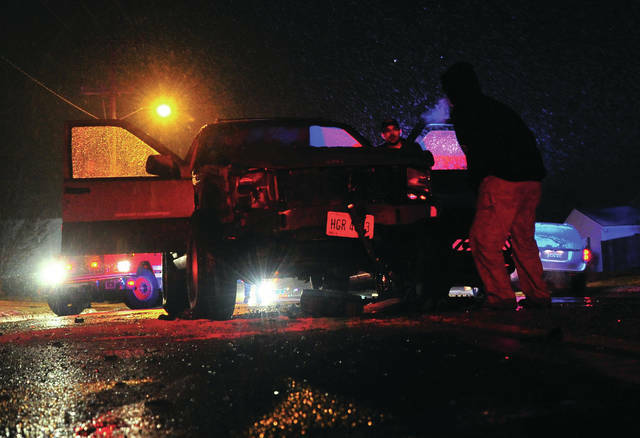 Mike Ullery | Daily Call A vehicle rests in the roadway on Sunset Ave. following a two-car crash on Monday evening. PIQUA — One person was transported following a two-vehicle crash in the 500 block of South Sunset Ave. on Monday evening. The crash occurred around 5:30 p.m. when a vehicle was stopped to make a turn into a driveway when a SUV failed to stop and crashed into the rear of the car. Piqua Fire Department medics responded along with Piqua police. The driver of the car was taken to Upper Valley Medical Center for treatment. Her injuries are not thought to be serious.The driver of the SUV was not injured. Piqua Police are investigating the crash. https://www.dailycall.com/wp-content/uploads/sites/30/2018/11/web1_112618mju_crash_sunset.jpgMike Ullery | Daily Call A vehicle rests in the roadway on Sunset Ave. following a two-car crash on Monday evening.